The Wright Flyer took off in 1903 powered by a measly 12 horsepower straight-four. Little did Orville and Wilbur know that just 110 years later, their pokey engines would eventually lead to a power plant with more horsepower than The Titanic and Shepard's Mercury-Redstone 3—combined. 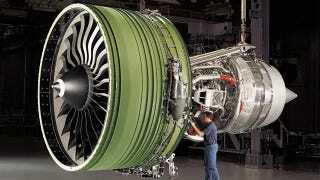 The GE90 series of aero engines from GE Aviation are now built exclusively for Boeing's latest models of 777 aircraft. The GE90 technology originally grew out of NASA's Energy Efficient Engine in the 1970s and first debuted in 1995 aboard a British Airway's 777. The first three models, boasted outputs between 74,000 to 115,000 lbf of thrust. Since 1995 the GE90 series has improved upon that performance with a pair of larger models, the -110B1 and -115B variants, that can blow with more than 125,000 lbf of thrust. These supersized variants are now built exclusively for Boeings newest and largest 777 models—the 777-200LR, 777-300ER, and 777-200F. The largest variant is the GE90-115B. Measuring 216 inches long and 135 inches wide with a 128-inch-diameter fan, the -115B weighs a stout 18,260 pounds. Surprisingly, despite the -115B's size, it is also the most efficient wide-body engine in service today. It utilizes a 10-stage air compressor, driven by the engine's two-stage turbine to generate a 23:1 pressure ratio turbocharger. The engine's construction is just as impressive as its performance. The GE90 is built from a new ceramic matrix composite material that can withstand far higher operating temperatures (up to 2,400 degrees F) than other similarly sized engines, which saves as much as 10 percent more fuel per long-haul flight than even earlier GE90 models. In addition to being the biggest engine in the world and the most efficient in its class, the GE90-115B is also the most powerful jet engine on the face of the planet. During bench testing at GE's Peebles, Ohio facility in 2002, the -115B demolished the previous record with an unholy 127,900 pounds—5,000 lbf higher than the previous record—and it wasn't even trying. Engineers were simply running an hour-long triple-redline torture test that just so happened to meet GWR criteria. And that's not even the only world record it holds. The GE90-115B also powered the longest commercial flight in history—a globe-spanning 22 hour, 42 minute jaunt in 1995 from Hong Kong to London—the long way. That's over the Pacific, across the continental US, and then spanning the Atlantic to arrive at Heathrow. I sure hope the in-flight movie was better than Madea's Latest Adventure. It's one of the busiest travel weeks of the year, so what better time to take a closer look how we get where we're going—and how we could be doing it better. Check out more of Gizmodo's Air Travel Week posts here.